We have a wide selection of doors that will perfectly suit the design of your home. 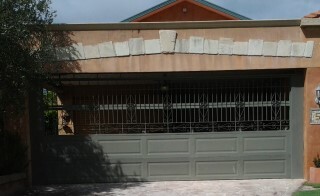 Our garage doors will enhance the visual appearance and increase the value of your home. The flexibility of timber, Perspex and aluminium as a door material offers unlimited design potential. Only superior sealers and outstanding levels of craftsmanship are used to create a garage door that suits the beauty and architectural appeal of your most important asset. Our extensive range includes roller doors, sectional / panel doors, tilt doors, (both spring and counterbalanced,) and custom door systems in a variety of architectural materials and finishes. With our experience and knowledge of automatic garage doors on the Gold Coast, we are able to offer you a wide range of solutions to suit your roller door, garage door and automatic / remote opening requirements. It’s good to know that your investment in your garage door is protected by our quality installation and backed up by our garage door service and repair team, operating throughout the Gold Coast. 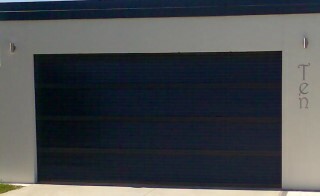 Like roller doors, sectional doors open and close vertically, they do not swing open outwards like Up-and-Over doors. As with roller doors, this means that you can park your car right up against the door and still open it without moving the car. This operation also allows for a big rubber seal to be fitted to the bottom of the door, preventing leaves and debris from entering the garage from under the door. The door closes tightly against the frame of the door, which includes a rubber seal down both sides, and also along the top of the door. This, added to the bottom rubber seal, makes your garage weather proof. The doors can be double skinned and insulated to provide varying insulation values. 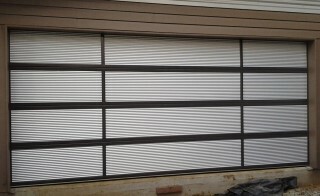 Sectional doors give greater opportunity for personal styling than roller doors, coming in either linear (with small, medium or large ribbing), or Federation styling. You can choose from a greater range of colours, including wood effect colours. Sectional doors are extremely robust and include security features that make them practically impossible to break into. 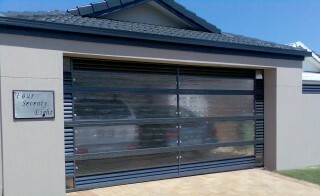 All sectional doors come with a one year warranty to give you peace of mind. Tilt a doors are basically frames that can be clad with many variations and forms depending on specification and budget. Starting with colorbond sheeting as the entry level through to western red cedar as one of the most popular options. For heavier specialised claddings, a counterweight and tilt a door can be designed and manufactured allowing for even greater scope of individuality. Whether you want a panel lift garage door, or a simple garage roller door, we have an innate knowledge of what fits where and also what's the most suitable look for your garage.